Boston Limited showcases its Personal Super Computer at Supercomputing 2011 (SC11). This system has 2 Intel Xeon processors, three NVIDIA Tesla cards and one NVIDIA Quadro card! Cooling is provided by a liquid cooling solution from Asetek. Asetek, the world’s leading supplier of liquid cooling solutions for computers, and Boston Limited, now in its 18th year as a distribution partner for Super Micro Computer®, Inc. (NASDAQ: SMCI), are pleased to unveil the first personal supercomputer (PSC) to feature all liquid cooled processors. Liquid cooling the PSC’s two Intel Xeon 5590 CPUs, three nVidia Tesla cards and one nVidia Quadro card is accomplished with six independent Asetek cooling loops. The PCS also demonstrates the first application of Asetek’s GPU cooling technology with nVidia Tesla and Quadro cards. Unlike earlier announcements of liquid cooled PSCs that described computers submerged in aquariums full of oil or equipped with consumer grade graphics cards, the Boston Limited liquid cooled PSC is built for commercial deployments. The supercomputer utilizes professional grade nVidia and Intel processors and Asetek Liquid Coolers give it the same level of service ability as air cooling. The PSC can simultaneously process compute-heavy tasks and render visually demanding graphics using nVidia Maximus technology. 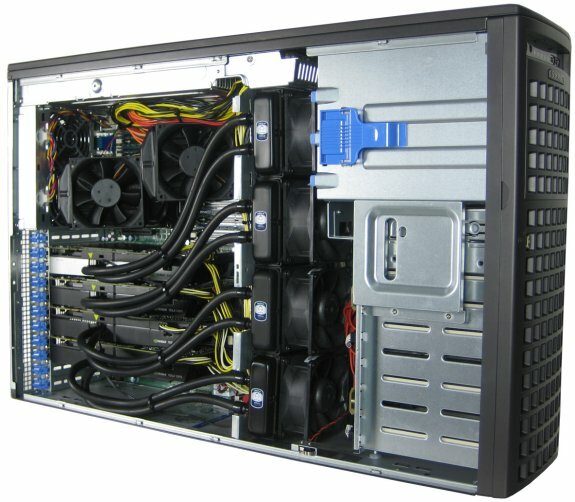 The Boston PSC is built on the Supermicro® SuperServer® 7046GT-TRF-TC4 platform with modifications to accommodate mounting the heat exchangers for the four GPU cards, three nVidia® Tesla™ C2075 companion processors and one nVidia Quadro® 6000 professional graphics solution, on fan rail situated mid-chassis. The two Intel® Xeon® Processor W5590 CPUs are cooled using all-in-one liquid coolers that mount as a single unit on the processors. The unit is currently on display in the Super Micro tradeshow display at SC11, booth #2918.